Ayazuki Mei has always been able to see ghosts and spirits, which kept her entertained in her family's antique shop but ultimately led to her isolation from her peers. By the time she entered high school, Mei took to wearing headphones to drown out the voices and unwillingly embraced her life as a loner, even as she dreamed of escape. Then one day she sees a Western-style magician performing on her way home, and he offers her an escape – to Meiji-era Tokyo! Lacking a few crucial memories, Mei finds herself being picked up by Ougai Mori and Syunso Hishida, who sweep her into a world of romance over a hundred years before she was born. The magician tells her that she has until the next full moon to enjoy it – but when her time is up, will she want to go home? Wishing to be able to go to another time and/or place is a pretty common fantasy for those on the outskirts of their social groups. The entire genre of time-travel romance could be said to have sprung up around it, as well as the continued love of such books as C.S. Lewis' The Chronicles of Narnia. While some of us may have spent our childhoods walking into closets (wardrobes being in short supply), Meiji Tokyo Renka offers a combination of the adult time-travel romance fantasy and the children's version with its young adult take on both genres. 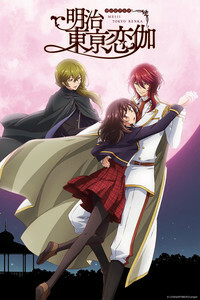 Based on the otome game of the same name (not available in English as of this writing), the story follows high school student Mei as she is sent back to the mid-1880s by a stage magician calling himself “Charlie.” Mei's been relatively unhappy ever since elementary school, when she learned the hard way that not everyone could see or hear spirits and ghosts and she was damned as “creepy” by her peers. Since that revelation, Mei's gone out of her way to avoid her old spirit friends, keeping the headphones on and the music up and trying to stay out of her classmates' way. When she stops by Charlie's show and he offers an escape, it seems like as a good an idea as anything else. What she doesn't expect is that she'll suddenly find herself in Meiji-era Tokyo, being helped into a carriage by author Ougai Mori and painter Syunso Hishida, then whisked off to a ball at the Rokumeikan where she meets a variety of other Meiji-era greats, such as folklorist Lafcadio Hearne, policeman Fujita Goro (AKA Hajime Saito), and other authors, actors, and statesmen. Eventually Charlie finds her and lets her know that she has a month here before he can send her back to her time, and Mei decides to just go with it. For history buffs there's a lot of fun to be had here, even without the other charms of the show. The cast of historical characters is impressive, with the time chosen for Mei's journey meaning that all of them are still young and healthy without too much finagling on the story's part. The addition of the gorgeous Rokumeikan, a Western-style hall opened in 1883 but demolished in 1941, is an excellent period detail, but other little pieces are thrown out that may be more accessible to viewers as well. Chief among them is Mei's inability to grasp the difference in the value of the yen in her time versus in the Meiji period – she routinely shocks her new friends when she says something costs “just” 350 yen while they're eating an elaborate banquet that cost maybe ten yen. She also can't put on a kimono or hakama, again surprising people, and her grasp of proper ladylike manners leaves something to be desired. That all of these things make Mei attractive to her suitors is par for the genre, but that bit of cliché doesn't detract from the story. Although there's a veritable bevy of beautiful boys vying for Mei's heart, the plot basically follows the route of only one character from the game: Ougai Mori. This sets Syunso up as the chief rival for Mei's affections, which in turn allows for a bittersweet quality that might otherwise have been saved for the end. It isn't full-out depressing, but it's so clear that Syunso has fallen for Mei while trying hard not to, even as he realizes that Ougai is the man she loves, that it feels a little bit like she's slowly breaking his heart with every scene they share. This is in part illustrated by using Mei's supernatural powers to help Syunso find the black cat missing from one of his most famous paintings, Kuroki Neko, which is a metaphor for him not overcoming his emotions, but rather accepting them. While Ougai is a perfectly good romantic interest himself, and one who seems to know that he may not have Mei for very long, he's also much more aggressive with her (within the very tame boundaries of the show) and treats her a bit like a child, which can be offputting. Mei herself has much more personality than is typical in otoge adaptations. She's got clear likes (roast beef!) and dislikes, a sense of purpose, and a willingness to adapt that helps to endear her to viewers as a character, to say nothing of a sense of self-preservation that makes her the only character I've ever seen simply duck out of a kabe don and move on. She can be a little gratingly perky at times, but she really does think things through, even if that means that what she wants in the moment must be acknowledged as not what she needs in the long run. In some cases, that's just as well, since history tells us that many of the men in the show didn't live long lives (although that does mean that they missed the Great Kanto Earthquake of 1923, so there's that), but since Meiji Tokyo Renka is selling us a fantasy, that's a bit of a mixed bag. Despite not-great visuals, particularly on the animation front, one awful and random song about electricity, and a few plot threads remaining undeveloped, Meiji Tokyo Renka is a cut above a lot of other reverse harem anime. With a heroine with a personality, more than a nod to history, and two main romantic interests who are both appealing, this is a genuinely entertaining show. If you're looking for a good otome story, this more than fits the bill. + Mei's got personality, sticking to one route streamlines the story, nice historical details.